Nike's impact on both pop culture and the shoe industry is unrivaled. It's consistently one of the most popular brands in the world and has an insane sneakerhead following. But of all the hundreds of shoes released since the 1970s, what are its most iconic designs? British designer Stephen Cheetham took it upon himself to set the record straight. 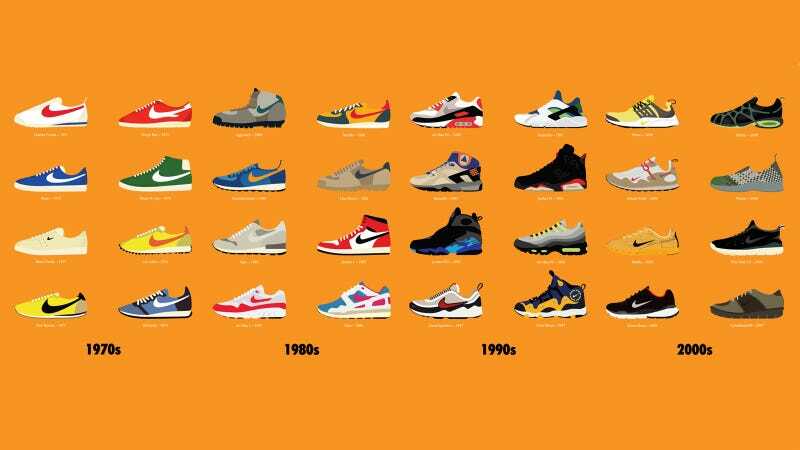 Though he admits having a personal penchant for "runners," his Nike Decades project is an entertaining overview of a whole range of iconic shoes from the last four decades, including everything from trainers to basketball shoes. "I was just looking for sneakers that I love. For the most part the sneakers illustrated represent my favourites from each decade, although there are a few models that I left out because I felt maybe they were a bit obscure," Cheetham said in an interview. "Also I did include some models that I'm not really keen on myself, but represent an important part of Nike's history, such as the AM 95." With each decade consisting of eight shoes, the models chosen by Cheetham represent what he believes helped Nike set it self apart from the rest of the competition beginning in the 70s: "I know I keep going back to the 70s runners, but that era for Nike set it apart from the competition, for me anyway. The designs were clean, simple, beautiful sneakers that no-one else was doing." It's funny though, that Cheetham excluded what is arguably one of Nike's cleanest and most simple designs of all time: the Air Force 1. But that's what you get when you compile an arbitrary list of just eight shoes per decade. You can't please everyone!